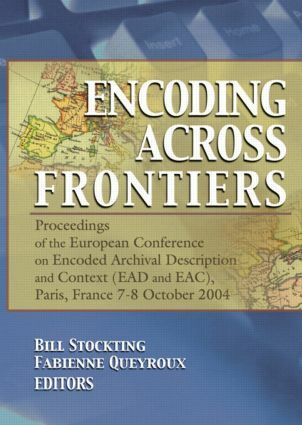 Encoding Across Frontiers is a careful selection of the finest presentations from the European Conference on Encoded Archival Description and Context (EAD and EAC) held in Paris, France in October 2004. International experts explore the history and practical use of EAD in Europe, the development and future of EAC, and a data format for information about archive holders, Encoded Archival Guide (EAG). Archivists will learn the latest in technology, practical applications, and international perspectives on how to transcend the printed word. Archivists have long imagined the practical benefits of using advanced technologies in their work. Encoding Across Frontiers is a detailed look at the technologies that have been transforming archival description, revealing a future that travels beyond the limits of traditional media. Respected authorities discuss ways to use technology to bring information to a wider audience through online services, standardization of data, the development and use of EAD, the issues in EAD implementation, case studies of implementation from France and the United Kingdom, the need to structure contextual information to allow access to archival material, and funding issues. Encoding Across Frontiers is crucial reading for every archive professional at any level, archive students in training, and any allied library and museum professional with an interest in EAD, EAC, and EAG.